To study the most extreme objects in the Universe, astronomers sometimes have to go to some extreme places themselves. Over the past several months, a team of scientists has braved frigid temperatures to set up and observe with a new radio telescope in Greenland. Taking advantage of excellent atmospheric conditions, the Greenland Telescope is designed to detect radio waves from stars, star-forming regions, galaxies and the vicinity of black holes. One of its primary goals is to take the first image of a supermassive black hole by joining the Event Horizon Telescope (EHT), a global array of radio dishes that are linked together. The Greenland Telescope has recently achieved three important milestones, beginning with "first light" last December. Following this, the telescope was successfully synchronized with data from another radio telescope, and was then used in an observing run of the EHT in April 2018. With these achievements, scientists from the Academia Sinica Institute of Astronomy & Astrophysics (ASIAA) of Taiwan and the Harvard-Smithsonian Center for Astrophysics (CfA) in Cambridge, Mass., have shown that the Greenland Telescope is able to explore some of the Universe's deepest mysteries. "We can officially announce that we are open for business to explore the cosmos from Greenland," said Timothy Norton of the CfA and senior project manager for the telescope. "It's an exciting day for everyone who has worked so hard to make this happen." ASIAA led the effort to refurbish and rebuild the antenna to prepare it for the cold climate of Greenland's ice sheet. In 2016, the telescope was shipped to the Thule Air Base in Greenland, 1,200 km inside the Arctic Circle, where it was reassembled at this coastal site. ASIAA also built receivers for the antenna. "It is extremely challenging to quickly and successfully set up a new telescope in such a cold environment, where temperatures fall below -30 degrees Celsius," said Ming-Tang Chen from ASIAA and the Greenland Telescope project manager. "This is now one of the closest radio telescopes to the North Pole." After ASIAA scientists began commissioning the telescope on December 1, 2017, they were able to detect radio emission from the Moon on December 25, an event astronomers refer to as "first light." Then in early 2018, the team combined data from the Greenland Telescope's observations of a quasar with data from ALMA. The data from the Greenland Telescope and ALMA were synchronized so that they acted like two points on a radio dish equal in size to the separation of the two observing sites, an achievement that is called "finding fringes." "This represents a major step in integrating the telescope into a larger, global network of radio telescopes," said Nimesh Patel from CfA and the lead scientist for the Greenland Telescope. "Finding fringes tells us that the Greenland Telescope is working as we hoped and planned." 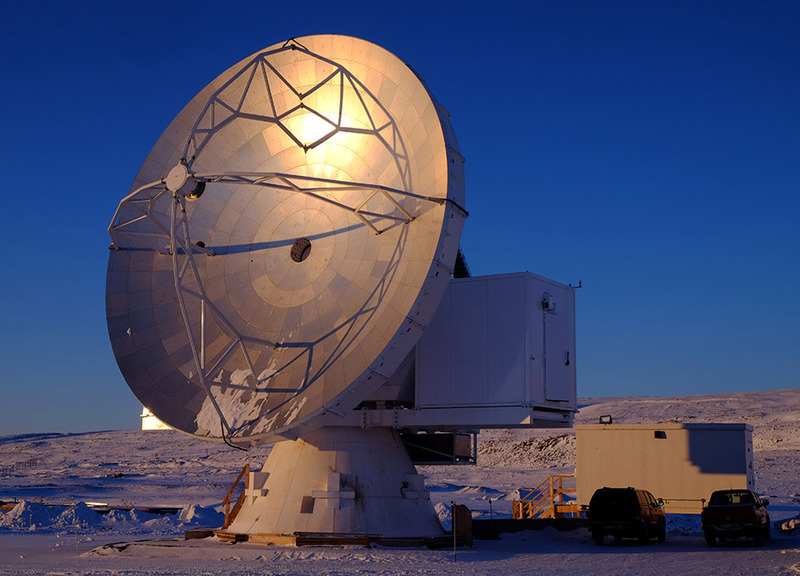 The Greenland location also allows interferometry with the Smithsonian Astrophysical Observatory (SAO) and ASIAA's Submillimeter Array and the East Asian Observatory's (EAO) James Clerk Maxwell Telescope (JCMT) in Hawaii, ALMA and other radio dishes, to become the northernmost component of the EHT. This extends the baseline of this array in the north-south direction to about 12,000 km. "The Greenland Telescope is a crucial addition to the EHT, allowing for an even greater separation between the radio dishes in the array and hence better resolution," said Keiichi Asada from ASIAA and the Greenland Telescope project scientist. "We are very excited that the Greenland Telescope is part of this historic project." The Greenland Telescope joined the EHT observing campaign in the middle of April 2018 to observe the supermassive black hole at the center of the giant elliptical galaxy M87. This supermassive black hole and the one in our galaxy are the two primary targets for the EHT, because the apparent sizes of their event horizons are larger than for any other black hole. Nevertheless, exquisite telescope resolution is required, equivalent to reading the titles of a newspaper on the Moon viewed from the Earth. This capability is about a thousand times better than what the best optical telescopes in the world can achieve. Scientists plan to use these observations to help test Einstein's theory of General Relativity in environments where extreme gravity exists, and probe the physics around black holes with unprecedented detail. In 2011, NSF, the Associated Universities, Inc. (AUI)/NRAO awarded the antenna to the SAO, representing the ASIAA/SAO team, for relocation to Greenland. A future site is under consideration at the summit of the Greenland ice sheet where scientists will be able to take advantage of lower water vapor in the atmosphere overhead to achieve even better resolution. The scientists and engineers involved in the first light commissioning of the Greenland Telescope (GLT) were Satoki Matsushita (ASIAA GLT co-PI), Chih-Wei Locutus Huang (ASIAA GLT support scientist), Jun-Yi Kevin Koay (ASIAA Postdoctoral Fellow), Nimesh Patel (CfA GLT lead scientist) and Tim Norton (CfA GLT senior project manager). The scientists and engineers involved in the commissioning to detect fringes were Ming-Tang Chen (ASIAA GLT co-PI, Project Manager), Keiichi Asada (ASIAA GLT Project Scientist), Hiroaki Nishioka (ASIAA GLT Support Scientist), Kuan-Yu Liu (EAO JCMT Technician), Chen-Yu Yu (ASIAA GLT Technician), Shoko Koyama (ASIAA Postdoctoral Fellow), Nimesh Patel and Tim Norton. Academia Sinica Institute of Astronomy and Astrophysics (ASIAA) is one of the 31 institutes and centers in Academia Sinica. ASIAA is located in the Astronomy-Mathematics Building on the campus of National Taiwan University, with a field office operating in Hawaii. Research topics carried out at ASIAA range from solar system, star formation, to extra-galactic science and cosmology.